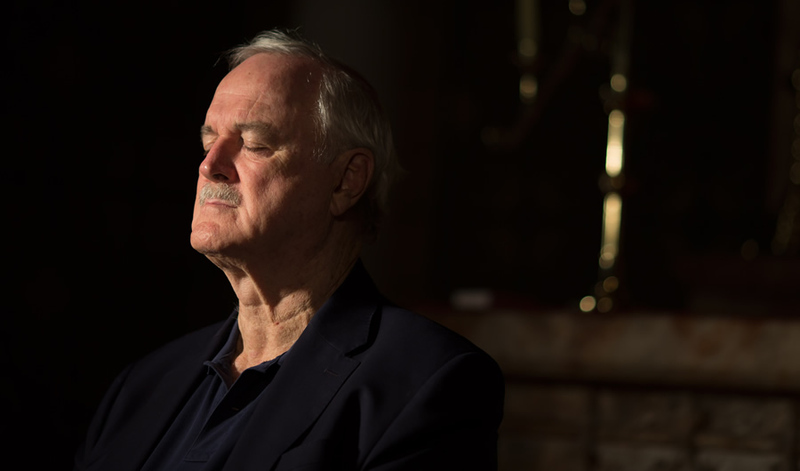 John Cleese at St. Patrick's Cathedral in Melbourne on March 24, 2014. So reads the first tweet of the year from the masterful John Cleese which, at the time of writing, has rather struck a chord with over 17,000 retweets and a further 20,000 likes. He’s right, of course. And while it’s not my number one dream for 2016 (World peace, an end to the refugee crisis, poverty eradicated: all in my top 3), it’s right up there with my hopes for the year as well. Science is a gift, a joy, an ongoing voyage of exploration, a journey of discovery (add your own twee cliché here), but if I make it my belief system, it’s going to leave some rather gaping holes in my assumptions about life and the universe. Science just isn’t enough. It can never be a belief system, because by its very nature there are always more questions to be answered, more wonders to be discovered. That, of course, leads to the question of what I do with those unanswered questions in the meantime. The answer: I need faith. Until science has definitively answered questions about alien life, the nature of consciousness, why we dream, what’s at the bottom of a black hole or why when I put two socks in the washing machine only one comes out, I need belief to fill the gap. I’m convinced that future physicists will discover something at least as wonderful as any god you could ever imagine. I think it’ll be something wonderful and amazing and something difficult to understand. I think that all theological conceptions will be seen as parochial and petty by comparison. It’s not enough to call it God. I’m trying to overcome to limitations of the 21st century mind. It’s going to be grander and bigger and more beautiful and more wonderful and it’s going to put theology to shame. Love the quote. It’s on the fridge. But it still sounds a lot like faith to me. Such belief might be based on vast swathes of knowledge about the way our world works, but it’s still belief. Religious faith works precisely the same way. No one has all the answers. There are always more questions. Anyone who thinks they’ve figured it all out should be viewed as arrogant or a loon. Yet religious faith should still be built on an equally intellectually robust foundation. The Christian faith, for example, centers on the person of Jesus — not a vision, nor a spiritual experience, but a living, breathing, person in history — whose stories and teachings transformed the value placed on women, children and the poor, who introduced the word “hypocrite” to our vocabulary, and who somehow managed to convince his own family he was God (have yet to succeed at this, but am trying); then there’s the impressive ability to convince hundreds of people who knew him that he’d come back to life from the dead, when the simple production of a corpse would have killed the fledging faith in a flash. Study his life; examine his death; read the claims about his resurrection; learn from the best historians; weigh up the evidence; come to a conclusion. Enough people have done that over the years, and for some, at least, their methods of investigation have led to belief. Sir Edward Clarke, former London politician and barrister (who once represented Oscar Wilde), is one deserving of a quote. To me the evidence (for Christ’s resurrection) is conclusive, and over and over again in the High court I have secured the verdict on evidence not nearly so compelling. Too many people think faith is the antithesis of factual evidence, like some great leap into the dark reminiscent of Indiana Jones plunging over a crevasse in The Last Crusade. Nothing could be further from the truth or more patronising to the many who’ve investigated Christ and for whom faith has resulted. Science isn’t a belief system. It’s not enough. There’s always more. Whatever conclusion you come to, 2016 is a great year to work out what you think about the most influential person in history. Investigate and believe — whether that leads to faith in God or not. Believe and investigate. If in 2016 more people conclude that science is solely a method of investigation, maybe more will figure out what they believe. Even better, maybe more will seriously examine the compelling figure of Jesus Christ. After all, it’s only 2016 because of Him, Mr. Cleese. Follow Andy on Twitter @AndyTilsley. This article was originally published at ChristChurch London and is reprinted with permission.